The training is a 10 module step-by-step digital course that walks you through exactly how to find, analyze, buy, renovate, and sell/lease real estate (with focus on foreclosed properties from banks). This is meant to be a 16-week* training program that will empower you to identify your first (or next) profitable foreclosed property, with the knowledge and know-how that will guide you from the beginning to the completion of the deal, and you will get more than 7 years worth of "in the trenches" experience gained from working on my own deals (plus lessons from the first 4 years of trying to find deals). Training content is available online and downloadable (with Platinum bonus) in video (.MP4) format, audio (.MP3) format, slides (.PDF), and spreadsheets for easy computations and analysis of properties (.XLS). Live Q and A sessions are done through webinars (with recorded replays), and these are delivered in a convenient, and organized way, that will give you proper direction for faster learning and success. Access to calculators for analyzing properties - I use excel sheets to quickly analyze properties, and I have created equivalent online calculators for quick and easy analysis. You get access to both! You get 30+ hours of step-by-step videos (excluding Q and A sessions and advanced topics which are another 50+ hours). I created the videos based on our own experiences and lessons learned, and I edited them all myself to keep them short, and direct to the point, while ensuring nothing important will be left out. 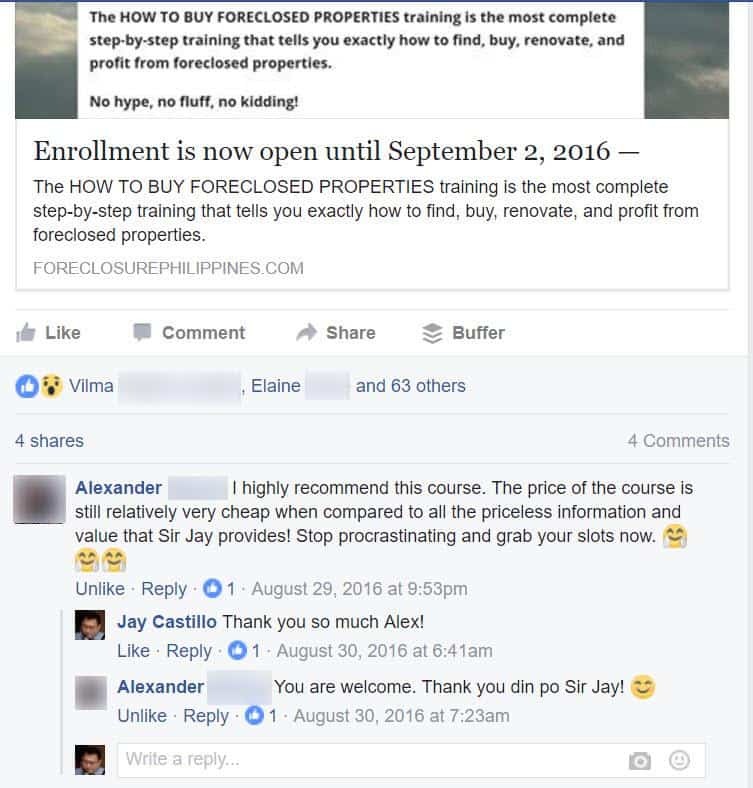 Based on questions from real people - In addition to our own experience, the content for the training is also based on our interaction with thousands of people on our blog foreclosurephilippines.com where I have answered more than 4,000 questions related to foreclosed properties. With unconditional 30-day money back guarantee! I have poured out my knowledge gained from experience, and I held nothing back in this online training. It is my hope that it will empower you to get started with investing in foreclosed properties. If, however, you are not happy with the online training, please let me know within 30 days and I will return your money – no questions asked. Are you someone who decided to start investing in foreclosed properties, but you really don't know how to get started? Are you someone who got inspired after reading a book, or attending a seminar, but you don't know what to do next? When you actually tried to find a foreclosed property to invest in, did you encounter so many questions that stopped you from moving forward? Have you found a foreclosed property you want to buy, but realized you don't know what to do with it? Do you want to know how to check if it really makes sense to buy a foreclosed property? Do you have more questions left unanswered about foreclosed properties? IF YOU ANSWERED YES TO ANY OF THE QUESTIONS ABOVE, THEN YOU NEED THIS TRAINING! Why do most successful real estate investors got started with investing in foreclosed properties? What real estate investing strategies are recommended for beginners? What are other things you need to actually purchase foreclosed properties? Common mistakes by beginning real estate investors, and how to avoid them. How do you know if a rental property is a good deal? How much does it really cost to buy a foreclosed property, renovate, and sell/lease (taxes, fees, repairs, etc)? How do you buy through auction or negotiated sale? Up to how much can I offer/bid while making sure I can still meet my target ROI? How do you get bank financing for the foreclosed properties you will buy? ​How do you complete the purchase/close the deal? How do you close a contract-to-sell deal? How do you close the deal if you purchased through a real estate mortgage loan? How about an all-cash purchase, what are the steps? What are the steps to transfer the ownership of a foreclosed property? When can you move-in/start renovations for the property you purchased? What do you need to get started with renovations? Should you renovate or not? How do you achieve long term success with real estate investing? How many more real estate deals and what kind deals do you need to "win the game"? When you hit a “road block”, that stops your real estate investing journey, you'll need a mentor who is willing to answer all of your questions. You get lifetime access to all content, including updates, new topics, new tools, etc. No more overwhelm with trying to remember everything at once because with this bonus, you can access everything, when you need it, for life! With a bonus upgrade to Platinum Membership, you will have download rights for all the videos, and audio files for offline viewing, and listening. *Also includes all future updates, new topics, and tools. Or think about this: What will it cost if you make a mistake when buying real estate? The downpayment alone on a bad deal can cost hundreds of thousands of pesos. Here's a better option: Enroll now to get the mentoring you need, and avoid making costly mistakes... pricing below. ENROLL ON OR BEFORE JANUARY 31, 2017﻿﻿ (TUESDAY) AND GET THE VIP BUNDLE AS A BONUS. (You save PHP 3,994.00 vs.
(You save PHP 4,491.00 vs. Send an SMS/Text message to +639178843882 and/or call (632)585-9200 to inform us of your deposit/remittance. Upon verification, you'll receive an SMS/Text message and/or email confirmation that you have successfully enrolled for the "How To Buy Foreclosed Properties" online training (login details will be sent via email). Please allow 24-48 hours for us to verify your bank deposit/remittance/transfer. Is the training through online videos or live (face-to-face in a class room) or podcast or virtual (through webinars)? It is a combination of both videos (with equivalent audio that are like podcasts), live webinars, and an actual meetup. With regard to live webinars, ours is really live, wherein there is no lag (unlike other webinars out there where there is a 30-second to 1-minute delay). We can talk in real-time, it’s really like we are in a live meeting/virtual classroom. The date of the live and face-to-face meetup will be announced in the middle of the training. The training is mostly digital, which means you can access it online from where ever you are, as long as you have a reliable internet connection. Alternately, this batch will also have download rights for all media via the bonus Platinum membership upgrade, which means you can go through the training course without an internet connection, after you have downloaded the videos/audio files. The venue is basically anywhere you choose, as long as your device can play the videos/audio files! I am based abroad / US /outside of Metro Manila/ I'm an OFW / I won't be back in the Philippines anytime soon/ Can I still attend the training? Since the training is mostly digital and downloadable, you will be able to access it online from anywhere in the world, as long as you have a reliable internet connection. "Can you apply what you will learn and start investing in real estate even if you are abroad?". My answer: It will be very difficult because you need to do physical due diligence and other things that can only be done while physically present. While you can outsource the legwork, I highly recommend that you will still be the one to decide to buy a property or not, so there won't be any blaming down the road. However, If you are planning to come home to do the actual investing in the near future, then you can attend this training while abroad, and then you can apply what you will learn when you come home. Just don't quit your jobs yet just to do real estate investing full-time. Please don't! Stay in your jobs and just do real estate investing on the side. Yes, it's possible! Only resign/quit your job after you have more than enough income replacement from real estate or other sources of income. Yes, all videos and corresponding audio files are downloadable via the bonus Platinum membership upgrade. Just keep in mind that these files are for personal use only and any unauthorized reproduction and or distribution shall be dealt with accordingly under existing intellectual property laws. The training modules and all lessons under each module will be unlocked on a weekly basis to prevent overwhelm. The training officially starts on January 28, 2017, but you can already access a few unlocked lessons in module 1 upon enrollment. Module 2 will be unlocked on February 4, 2017 and so on and so forth for the rest of the modules. Is the training schedule fixed or can I access the training at my own pace? The unlocking of the training modules is fixed (refer to schedule above) but once unlocked, you can go through the training at your own pace (you can even download the video/audio for taking the training offline). Schedules for the Q and A sessions are to be finalized based on results of the survey to be conducted inside the training, to maximize attendance, and make the most out of each session. Can the training be done during weekends? Yes, the unlocking of the training modules is done every Saturday, but you can actually access them any day, 24x7, at your own convenience. The live Q and A webinar sessions are usually done during Saturday evenings. How many hours per day do I need / how long will it take to finish the training? On the average, each module will have several video lessons that are about 10 to 30 minutes long each, and will be between 2 to 3 hours in total. This can become shorter as we streamline the training videos. You can also play the videos at faster speeds to finish quickly. My advice is to spend about 30 minutes a day so you can go through each module easily in a week. The whole training is meant to be taken in 4 months, so you will have time to do the action steps for each module. But since an actual real estate transaction can take months or even a year to complete, those who enroll in this batch can rest assured that they will have lifetime access via the bonus Platinum membership upgrade. My wife and I want to enroll, do you give a discount for couples? Yes of course! I will give the best discount for married couples: only one of you needs to enroll, and both of you can access the training as a couple. It does not get any better than that! Sorry guys, I no longer provide real estate broker related services as we are now focused on our own real estate investments, among a lot of many things that need our focus and attention. We had to say goodbye to brokerage for now because it was eating up the biggest amount of our time, and it was really not compatible with our other current priorities. Thank you for understanding. 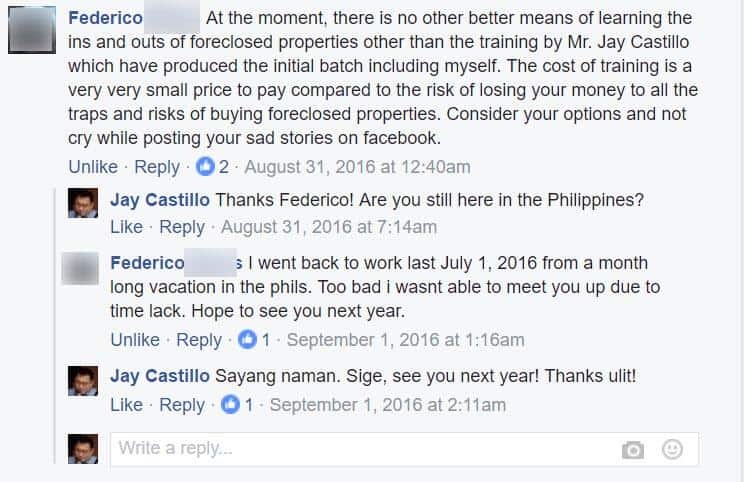 I started ForeclosurePhilippines.com as a tool to help me when I was still starting with investing in foreclosed properties. Little did I know that it will be a big help to others who are just starting with real estate. My passion is with making things work, and documenting what works, what doesn’t. This is exactly what I’ve been doing with real estate. After several successful deals, I was able to quit my job as the I.T. Manager of a multinational company to focus on real estate full-time, and I have been documenting my real estate journey ever since. Now you will know what worked for me so you can do the same, and avoid making the same mistakes that I did. I feel honored and get a great sense of fulfillment whenever I’m invited to speak at seminars and talk about investing in foreclosed properties. Participants tell me they learned a lot, but they often ask if I have my own training because they want to learn more. At first I was hesitant because I know how much I have to cover to give the most complete picture of investing in foreclosed properties, and I knew this would be a huge undertaking that would be hard to finish, especially since I am working on my own deals. It became very clear that I just had to do this. I feel that it’s not right for people to rely on incomplete information out there, so after more than 4 years, I was finally able to create this training. Looking back, how I wish there was a step-by-step training like this when I was getting started. And it turns out that I would have to be the one to create one for everyone. Simply put, my goal with this training is to equip you with the knowledge and wisdom gained through years of experience, so that those who go through this training can actually go out there and start investing in real estate the right way. I held nothing back and shared just about everything we have learned through the years, and I am committed to helping you achieve your real estate investing success, through this training. I look forward to working with you inside the training area. Copyright © 2017 Jay Castillo - ForeclosurePhilippines.com | True North Online Marketing Services. All Rights Reserved.